A PILGRIMAGE TO DEATH by Alexa Padgett is LIVE! 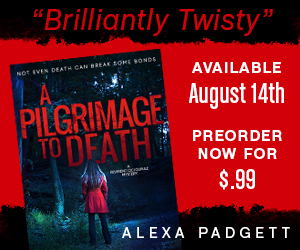 We’re super excited to be able to share Alexa Padgett’s all-new thriller A Pilgrimage to Death with you! This is my first book by this author and is one of my favourite genres, a murder mystery thriller; the first book in a series featuring Reverend Cici Gurule but can be read as a standalone. Cici Gurule is a progressive reverend who went back to her hometown when she felt something was wrong with her identical twin, Anna Carmen. Her plan of joining her boyfriend for an adventure to South America was abandoned. We have all heard how tight a bond is between twins and we see this in Cici and Anna Carmen. So when Cici received a phone call that Anna Carmen was murdered she had to find out who killed her twin. However, when she starts digging up dirt on some people, she receives warning notes and dead birds on her doorstep and some of her parishioners start dying. She needs to get to the bottom of this with the help of Sam, an old friend. He is a detective who previously worked in the big city, but also came back to town to help solve the murders and a much bigger problem which involves a drug ring. Narrated in third person, this gripping story is fast paced, full of suspense with a touch of the paranormal. I had conflicting feelings regarding the mystical angle to this thriller which is unreservedly sprinkled throughout the book, but somehow it adds credence to the tale. This is not your usual whodunit thriller; nonetheless, it does make it more interesting and attention-grabbing. Sam’s backstory was implied that he was more into Anna Carmen in the past. As a secondary character, his loyalty and protectiveness towards Cici meld well with her stubborn, determined and feisty persona; they complement each other. Bear in mind that this is not a romance novel so the focus is about solving Anna Carmen’s murder. Trying to keep up with the plot twists in the story kept me up all night but it was worth it. This is not your usual run of the mill murder mystery yarn and I am glad I got the chance to read this author’s book, it won’t be my last. Enter Alexa’s Giveaway to win a $50 Amazon Gift Card! Previous Previous post: REVIEW ~ BOY TOY by Sarina Bowen & Tanya Eby is LIVE!